You’ll be charged for parking in car parks on Sundays and bank holidays if Shropshire Council’s new charging scheme gets the go-ahead. You’ll also have to pay nearly three times the current price to park on Ludlow’s streets for three hours. Charges in the Castle Street car park will rise by 167% for four-hour stay. If you have deep enough pockets, you’ll be able to park anywhere on-street or in a car park in Ludlow for as long as you want. Residents will be able to park in the car parks 24-hours a day, seven days a week – if they can afford it. 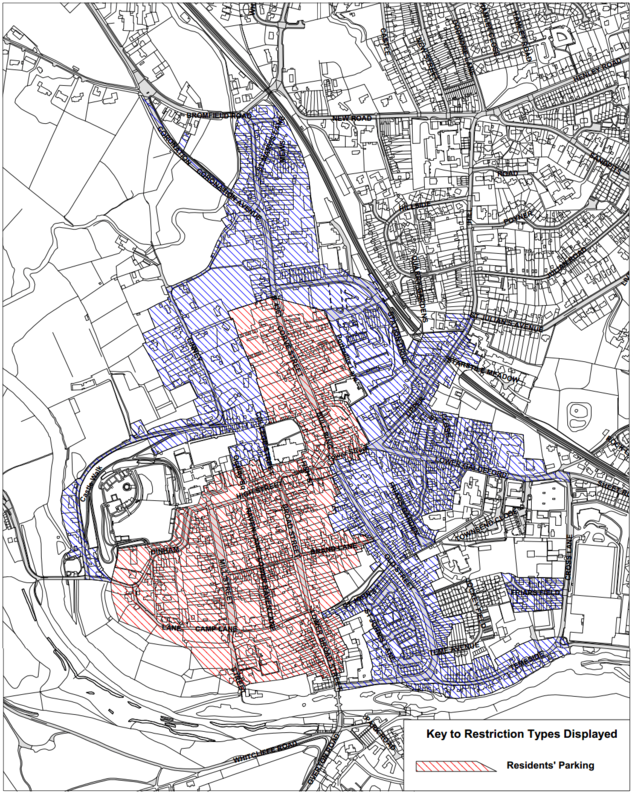 Shropshire Council’s new parking policy is fine-tuned for Shrewsbury, not the market towns. This could be an opportunity to improve parking in Ludlow. But if the current proposals go ahead, I fear they will hit our local economy. On Tuesday, Shropshire Council published a new parking charge regime for the entire county. There are a lot of detailed changes proposed in thirteen documents. Subject to cabinet approval on 12 July, the council is aiming to consult on the new regime. A final decision on the new scheme is expected in November. There are some good things about the proposals. Charges will be clearer and some will be lower. But overall, the scheme will make parking in Ludlow more expensive and less flexible. Many of our key parking areas will become clogged with long term parkers. They won’t then be available for tourists and shoppers. Our visitor economy will suffer as a result. In Ludlow, charges will be hiked in our main short stay car park on Castle Street. Worse, it will no longer be short stay. Residents and visitors will be able to park 24 hours a day, seven days a week if they can afford £35 a week. The cost will be as low as £19 a week on an annual season ticket. I fear that Castle Street car park will become clogged with long stay parkers. Shoppers and visitors will have nowhere to park off-street near the market. It is vital for the economy of our town centre that Castle Street remains a short stay car park. More than half the 500 or so off-road spaces in town are in the Galdeford car park. This stretches from the Library to Tesco. The parking charges here could fall under the new policy. But the proposed changes will lead to Galdeford becoming a car park clogged with vehicles owned by long stay visitors and residents. The Galdeford car park needs rezoning. The upper level behind the Library and the former Budgens store should become short stay. This will promote a high turnover of vehicles. That’s essential to allow people visiting the Library and the two nearby GP practices to find space when they need it. We also need extra disabled parking spaces close to the Station Drive and Portcullis surgeries. The two lower levels of the car park should become long stay. Town centre on-street parking charges will go up from £2.20 for three hours to £6.00. That’s far too big an increase. A bigger concern is the proposal for abolishing the three-hour limit on parking. Anyone will be able to park all day and all week if they can afford it. The town centre streets should be reserved for residents with permits and for short stay visitors and shoppers. Our car parks in Ludlow are currently free on Sundays, also on bank and public holidays. If this policy is implemented, charges will apply seven days of the week. Having read the 145 pages of documentation, I get the impression that this is a model designed around the needs of Shrewsbury. It certainly isn’t fine-tuned to the needs of Ludlow and the smaller market towns. There is talk of discouraging parking in the loop in Shrewsbury and making its charges comparable to Telford. But there is no acknowledgement of the need to proactively manage parking in the smaller towns like Ludlow. The proposed strategy aims to raise more money for Shropshire Council – but we are not told how much. We need to know how much the policy is intended to raise so we can understand the balance between the council’s need to raise revenue and our need to manage parking in our market towns. I think we can get this strategy right if Shropshire Council listens to needs of small towns like ours. But it will need to change its initial approach to make this strategy work for Ludlow. The council wants to introduce ‘linear pricing’, jargon for car parking being charged at a constant hourly rate. This will replace the current arrangement where the effective hourly rate decreases the longer you stay. Car parks around the county have been divided into seven charging bands, with prices varying from free to £2.50 an hour. Motorists will get what they pay for. If they put £2 into a machine on a car park where the charge is £1.20 an hour, they will get 1 hour 40 minutes. In Ludlow, the minimum parking period will remain one hour. Parking charges will zoom upwards on street and for users of the Castle Street car park. Other car parks, will remain at similar prices to those at present and some charges will fall. Full details are below. The following are the four-hour rates, a typical period that a visitor and many others stay in our town. Below are the three-hour on-street parking rates for those not holding residents permits. The council is planning to issue countywide season tickets. A ticket purchased for a more expensive car park will be valid in cheaper car parks. Tickets for Ludlow car parks will cost between £10 and £35 a week. For annual tickets, the council is consulting on prices ranging from £240 in Galdeford B to £1,000 for Castle Street. Three and six-month season tickets will also be available. Charging will start at 9am rather than 8am, giving more time for people who park overnight to get underway in the morning. This looks good but if you don’t move your car by 9.01am, will you get a fine or will you have ten minutes leeway? Charges will apply to 8pm at night, not 6pm as at present. That will catch a lot of people out, if and when the new regime is implemented. I anticipate another period of penalty ticket slapping. The consultation documents make no explicit mention of Sunday parking charges. In Ludlow, we already pay for on street parking on Sundays (we were falsely promised that these would pay for a Sunday park and ride). The tenor of the documents going before cabinet is that parking charges in car parks are to be extended to Sundays, and public and bank holidays. Back in May 2013, then council leader Keith Barrow announced a fifteen minute grace period “for those people who just want to pop into town for a short time to run an errand or visit a particular shop.” This is to be abolished. People will just get 10 minutes before a fine is slapped on the windscreen. The council says, “If you include the 10 minute ‘observation period’ before a ticket can be issued, people can currently park for free for up to 25 minutes.” My experience is that people rarely ever get 25 minutes grace in Ludlow. The council is proposing that the division between short stay and long stay parking will be abolished. Drivers will be able to park up for as long as they want providing they pay the charge. This applies to on-street parking as well as the car parks. This proposal could significantly damage the retail trade in Ludlow. The council plans to charge for parking up to 8pm rather than 6pm as at present. This will discourage parking in official car parks just as we are trying to encourage it to ease parking problems around the market area. It will of course, lead to more parking fines as people get used to the new regime. Currently a parking waiver allows tradespeople to park their vehicles for up to one day in a car park, on-street parking area or a restricted parking area while they carry out work. This costs £10 or £15 a day. This is to be replaced by a single charge of £20 a day. The council says, “The fee is to cover the council’s administration costs.” It also thinks that permits are currently too easy to obtain, leading to parking bays being unnecessarily blocked. £100 a week is a ridiculously high administration charge. (Ten traders over 50 weeks will generate £50,000 for the council.) While there might be minor abuse of the system, most permits are taken up by builders and fitters working in local houses and shops.
. Ludlow has 511 car park spaces run by Shropshire Council. The Linney car park is operated by Ludlow Town Council. There is no official count of the number of on-street spaces, which lack marked parking bays. All this will result in is yet bigger problems with on street parking in the areas outside of the current restricted areas. Gravel Hill, St Julians Avenue, Julian Road and many others are used as free parking for town centre workers, people using the train station (for a week at a time) and shoppers. Causing huge inconvenience for the residents in these areas that don’t have off street parking.